Judging by overall plot structure, “The Bottle Imp” isn’t just a formulaic episode of Grimm, but a relentlessly predictable hour that offers very little to viewers looking for something more than a show that can easily fade into the background while the rest of the country watches baseball. One late twist that turns an abusive father kidnapping into a Damien from The Omen situation—or perhaps sort of a Wesen version of The Good Son with Macaulay Culkin and Elijah Wood—saved a rote Law & Order: SVU level crime procedural. But though the episodic plot is a disappointment, the world building details helped rescue what would’ve otherwise been a massive failure of an episode. 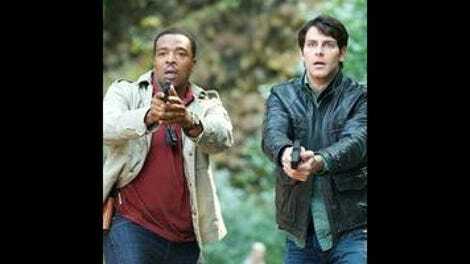 The scenes outside of the episodic plot, working to expand the world of Grimm, really landed this week, helping to bring Hank further into the Wesen world, establishing Monroe as the temporary overseer of Rosalee’s spice shop, and finding a satisfactory compromise of an island to strand a pregnant Bree Turner before she can rejoin the action with the rest of the main cast. First, the opening scene: when clips of Juliette regaining her memory aired in the “next week” segment after last week’s episode, I was really nervous that the show would make the giant mistake of bringing her memory back entirely intact and restoring the status quo from the first season. It would have been a weak move to make Nick so happy and fix his relationship with Juliette in such an uncomplicated way. But the whole cooking scene with Nick and Juliette, as she remembers her entire history with Nick through one simple memory of telling him a personal story, and figuring out all of the Grimm information and forgiving him—that’s all a dream as Nick sleeps on the couch while his phone buzzes to call him into work. It’s a great bait and switch even if the audience sees it coming, and it maintains an air of mystery around how the two of them can repair something that is seemingly irreparable. Even more unexpected is the Juliette/Renard development. Adalind’s curse through her cat put Juliette into a coma, but it seems that Renard’s half-royal status didn’t precisely do the trick in waking her up unharmed. When she visits the station in the middle of the case, greeting Sgt. Wu and Hank, it’s just a drop-in on Nick to help jog her memory. But when Renard shows up to say hello, it starts a nasty side-effect chain reaction that has Renard typing Juilette’s name over an over again into his computer—when he should be working on the 2012 budget no less!—and Juliette imagining Renard’s face right after kissing Nick while they dance during a romantic dinner at home. That plotline clearly has a lot more coming, and it’s going to be risky, but at least it’s compelling. I do have one slight problem with this development: it has absolutely no basis in the source material of the series. It’s just magic made up on the fly, and as such is subject to logical questioning. Grimm plays fast and loose with its fairy tale source material—often the epigraphs don’t originate from the fairy tales—but injecting random magical elements with no organizing principle or means to explain the fantastical elements won’t help. The second scene that sticks out is Hank’s introduction to the Magic Winnebago (or whatever kind of trailer it is, I don’t care at this point, Winnebago sounds best), where he’s dumbfounded by the wealth of information Nick has been hiding. Most intriguing is his reaction to Nick’s weapons cache, particularly the Elephant Gun, which Monroe used to save Hank from an ogre attack. Hank seems as though he wants to thank Monroe for saving his life, but I’m not exactly sure his loyalty is completely with Nick right now. One thing is for sure: the entire scene is punctuated by much-needed laughter as Hank flips through a Wesen book—past the entry for Hexenbiest— and generally wigs out on the plethora of information. Speaking of Monroe, he gets an entirely superfluous plot this week, taking over Rosalee’s spice shop and trying to fulfill orders for regular customers. But in somewhat sitcom fashion, he messes one order up, for a struggling mouse Wesen, which causes the poor sap to go crazy in his apartment, painting the walls and taking a chainsaw to a grandfather clock. Monroe’s reactions are priceless, as is his distraught facial expression as the grandfather clock is obliterated, but this wasn’t as much a B-plot as a Z-plot, having nothing at all to do with the rest of the episode besides some screen time for Silas Weir Mitchell and Bree Tuner. Not that I’m complaining, but it’s plain to see that the best episodes of Grimm fold every major character into the same plot line, working together as a team and bouncing dialogue off one another. I know I’ve ignored the episodic plot almost entirely, but that’s because it was largely uninteresting, just a standard kidnapping plot with a late third act twist to reveal a demonic child. The concept in the Wesen world of a child developing too early and growing out of control is a nice detail, as is the juvenile hall guard who’s a friend of Monroe’s and a fierce Wesen to boot. But it wasn’t particularly memorable, and though it won’t stick in my mind, the periphery scenes and sparse overarching details stick out, lingering for an episode that will stand out for an exemplary self-contained plot within the larger framework of an improving world. Filed under terribly tacky ideas: Grimmster of the week. I wasn’t convinced by Rosalee’s involvement via phone call at the start, but once Monroe realized his egregious mistake with, “Let me pose a hypothetical…” I was on board. Adalind returns, but only in a phone call to Renard, keeping her location far away from the Captain’s reach a secret. 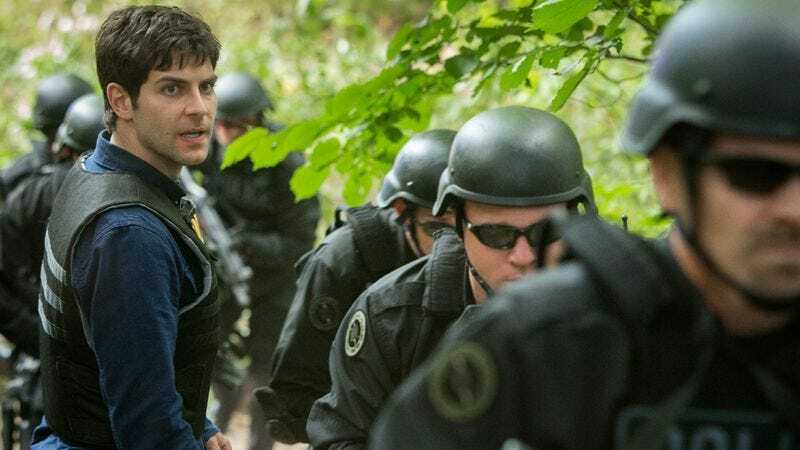 But as the preview of next week’s episode reveals, she’s a lot closer to Renard (figuratively speaking) than the Portland police captain thinks. I am excited for the Halloween episode to tackle the Mexican legend La Llorona.